We review the new XP130, Fujifilm's latest waterproof compact camera, with built-in Wi-Fi and Bluetooth. 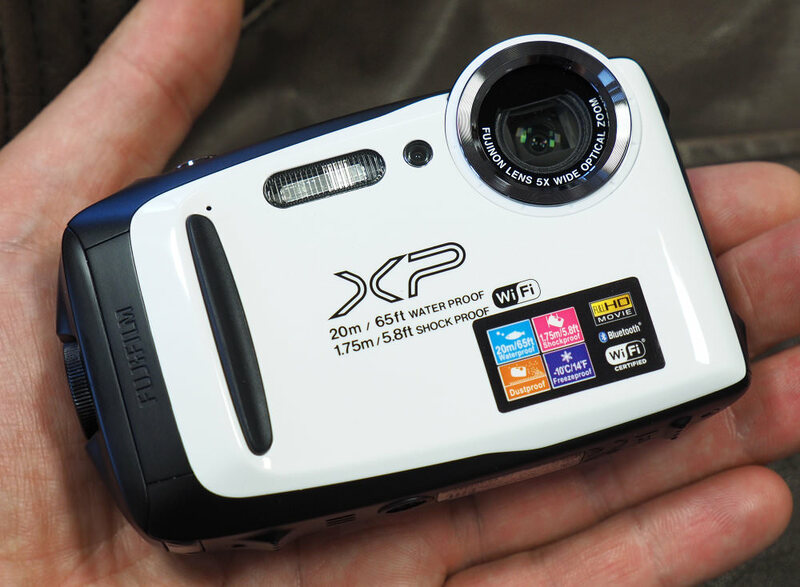 The Fujifilm FinePix XP130 updates the XP120, and adds Bluetooth, plus improved battery life. There's a 5x optical zoom lens, and the camera is waterproof down to 20m, there's also a 16-megapixel sensor, 3inch screen and Full HD video recording. 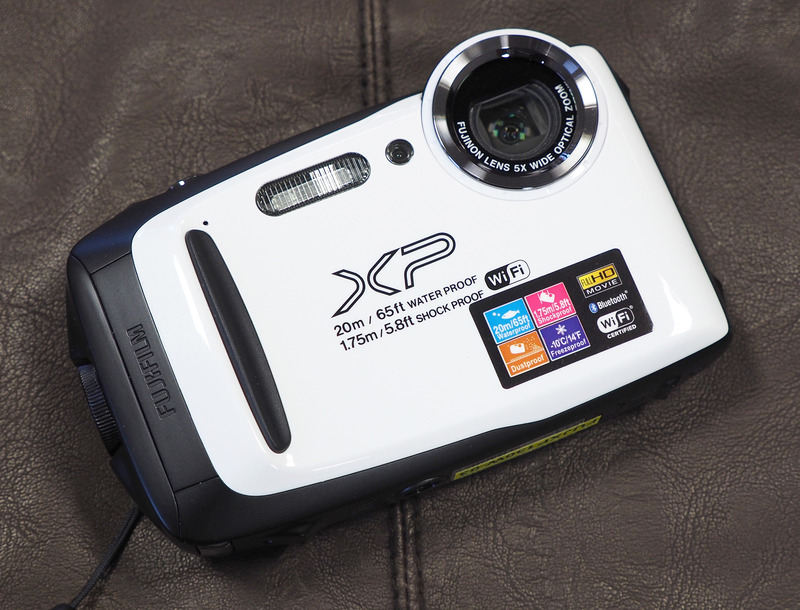 TLDR: The Fujifilm FinePix XP130 adds Bluetooth, and improves battery life slightly to 240 shots. Nb. Due to the similarities between the XP130 and XP120, this review is based on the XP120 review. The Fujifilm FinePix XP130 features a 16 megapixel BSI CMOS sensor, a wide-angle 5x optical zoom lens equivalent to 28-140mm in 35mm terms, and there is optical image stabilisation built-in, which moves the CMOS sensor to counter camera shake. On the back is a 3inch screen, with a resolution of 920K dots. Wi-Fi and Bluetooth are built-in and the camera is compatible with the Fujifilm Remote Shooting app. Instax printing is also supported. The XP130 has a waterproof rating down to 20 metres, and the camera is shockproof to 1.75 metres, freezeproof, and also dustproof. FullHD video is recorded at 60 or 30 fps and you can use optical zoom while recording. Audio recording is from the built-in mono microphone. If you want to shoot quickly, then the camera will shoot at 10fps in continuous shooting mode. There are a number of shooting modes, including Scene Recognition Auto, Auto, various scene modes including underwater, HDR, motion panorama 360, plus advanced filters and effects. There are no manual controls, but there should be enough modes here to suit most people. As you can see, the Fujifilm FinePix XP130 offers quite a good set of features, without being as expensive as other waterproof cameras. 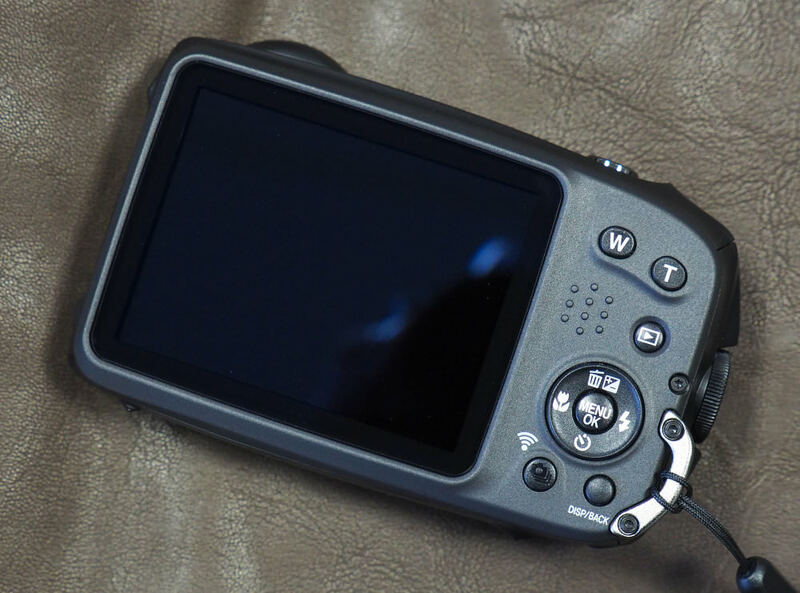 The Fujifilm FinePix XP130 looks good, being pretty much identical in design to the XP120. The camera feels quite well built for a (mostly) plastic camera. There is a small rubber grip on the front of the camera, and the rear has a slight rubber feel. The shutter release button is a good size, and has a decent texture to it, to help find it. There is a metal wrist strap loop on the back, and there is a plastic tripod mount underneath the camera. The battery/memory compartment has sockets for HDMI and MicroUSB charging. This compartment has a double locking system so that it makes it difficult to accidentally open in, as well as providing a good seal to keep water out of the camera. 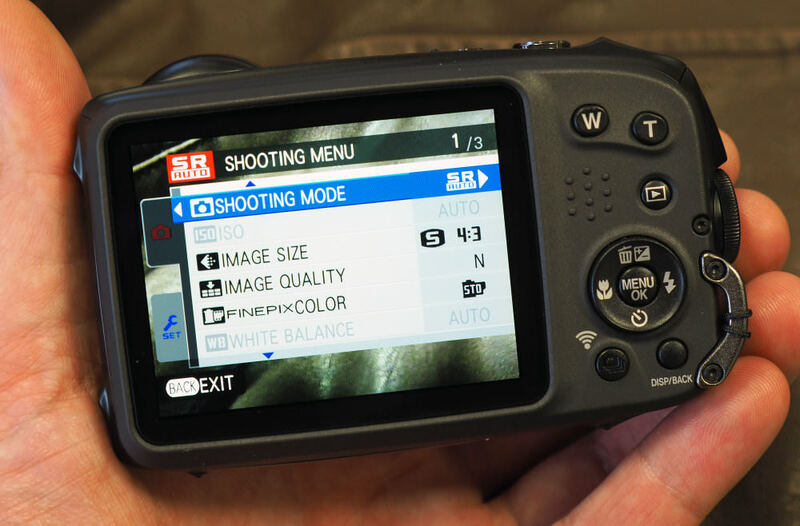 The menu button brings up the menu system, where you'll find all the usual options, as well as the option to change to a different shooting mode. The menus are clearly laid out and quite easy to read thanks to the 3inch screen. The screen isn't a "gapless" design, so visibility isn't always great, particularly in bright light or underwater. The buttons on the camera can feel a little stiff at times, particularly the 4-way control pad. Wi-Fi features - The XP130 comes with built-in Wi-Fi and Bluetooth, so that you can remotely control the camera, and transfer images to your smartphone or PC. The app on the smartphone works quickly making it easy to transfer images and there is a good level of control over the camera when remotely controlling it. You can add GPS / Geotag location information to photos from your smartphone as well. You can now setup a connection to an Instax printer, letting you print your photos directly. With Bluetooth, it's possible to transfer images, using less power than Wi-Fi. Battery life - Battery life is rated at 240 shots (an improvement over the XP120's 210 shots) according to Fujifilm / CIPA test results, which is fairly low, but an improvement is always welcome. 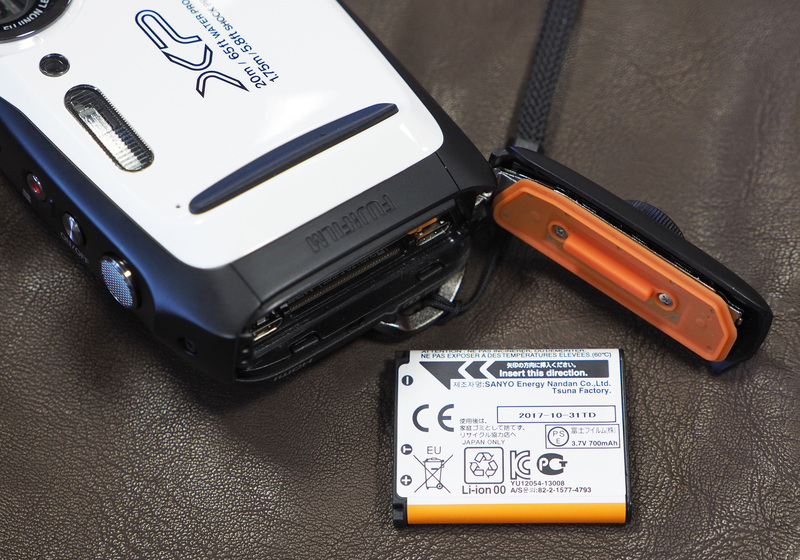 We would recommend a spare battery if you plan on travelling away from a charging point, although the ability to charge using a MicroUSB cable is useful here. Speed - The Fujifilm FinePix XP130 isn't the quickest camera available, but in good weather conditions, with good light, performance and speed were reasonable. In low light, underwater or when trying to take macro or close up photos, focus struggled and the camera did occasionally miss a few shots. Camera Performance - Exposure is reliable, and colours are good, with the camera producing images that look reasonable, particularly when taken in good light. Photos taken with flash are reasonable with no red-eye visible, although the flash isn't the strongest we've seen on a camera, and the portrait photo isn't particularly sharp. The 5x optical zoom lens gives a good zoom range from wide-angle (28mm equivalent) to telephoto (140mm equivalent), however, the level of detail captured is quite low, with images quite soft. Flare can be an issue when a bright light source, such as the sun is in the frame. Purple fringing is fairly well controlled. The close-up macro focus is reasonably good, although the level of detail captured by the camera is a little disappointing, and care needs to be taken to avoid getting fingerprints on the lens. ISO Noise Performance - Noise performance is reasonable up to ISO400 and ISO800. However, the biggest problem with viewing images at 100% is how soft and over-processed the images look. If you're sharing images to Facebook or another social media website then this might not matter too much as colour saturation remains good until the highest ISO settings. At ISO6400 images are taken at a reduced resolution. White Balance Performance - Auto White Balance (AWB) performs well under tungsten lighting with a warm result produced, and a much more accurate result when using the Tungsten preset. Under fluorescent light, the AWB performs very well, and the fluorescent preset(s) give a strong colour cast to the images and are best avoided. Results are reasonable under mixed lighting. Digital Filters - There are a number of digital filters and effects available in-camera, as shown above. However, with Wi-Fi and Bluetooth built-in to the camera, you're likely to find better filters, effects and editing possibilities on your smartphone or tablet. Panoramic photos are 1088 pixels tall, which produces a low-resolution image. You can shoot 120, 180 or 360 degrees. The film modes available are standard, chrome, black and white and sepia. 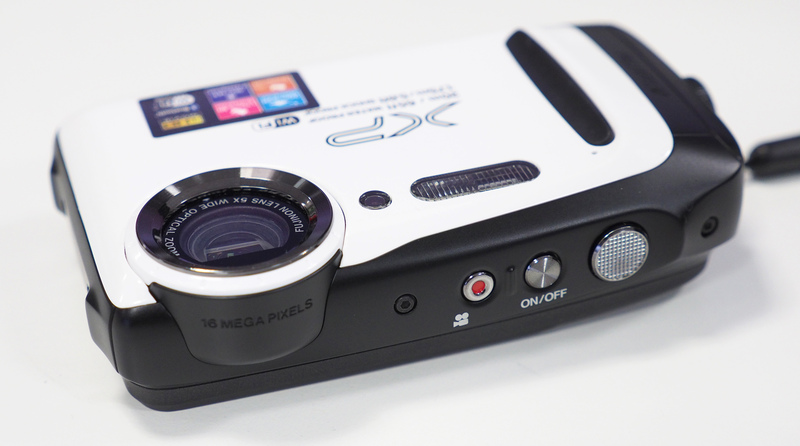 Video - The camera records Full HD video (at 60fps) with mono sound, and optical zoom is available. You can also record high-speed video, although the resolution is reduced, with the camera offering VGA video at 120fps, 320x240 video at 240fps, and a tiny 160x120 at 320fps. With a slow lens, particularly at the telephoto end of the lens, the camera will struggle a little in low light. The Cinemagraph mode creates a video file, with part of the image still. The Fujifilm FinePix XP130 is available for around £179 if you shop around, making it quite good value for money, although you could look at the previous version while it's still available. If you want a brighter lens, then you'll need to spend much more money. Have a look at other options in the Top 10 Waterproof / Tough Cameras. You'll also need to buy a memory card and a case or bag to keep your camera safe and protected - have a look at our complete guide to camera bags. The XP130 improves battery life, and now has Bluetooth. Unfortunately, like the XP120 before it, the camera struggles to give good image quality, with the folded optics lens, and slow aperture producing images with low levels of detail. If you don't need the zoom, and have a good smartphone, then you're likely to get better image quality from a smartphone like the Samsung Galaxy S7. However, if you would rather take a budget waterproof camera, instead of a more expensive smartphone then the XP130 could be a good choice, particularly if you're going somewhere sunny and bright, so that you can share photos to social media websites. In this situation, the camera should gives good results, particularly as the camera has good colour, however, we wouldn't recommend looking at photos in too much detail.